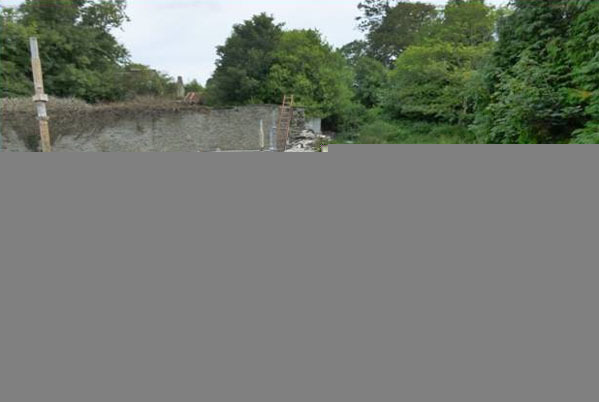 Newnham Park Estate, East Wall ~ Plympton, Plymouth. 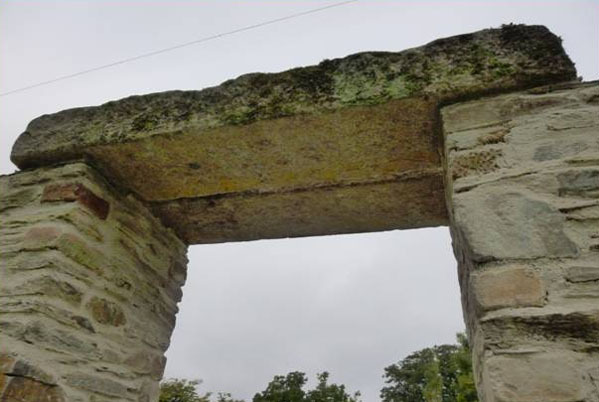 Originally, Newnham was called ‘Niweham’ and it is first recorded as a settlement in 1292. By 1325 it was known by its more modern pronounciation of ‘Niwenham’, meaning ‘new ham’ or ‘new pastures’. 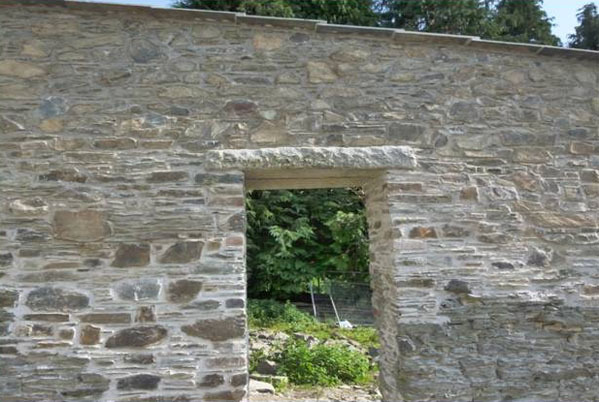 It is situated in the parish of Plympton St. Mary. 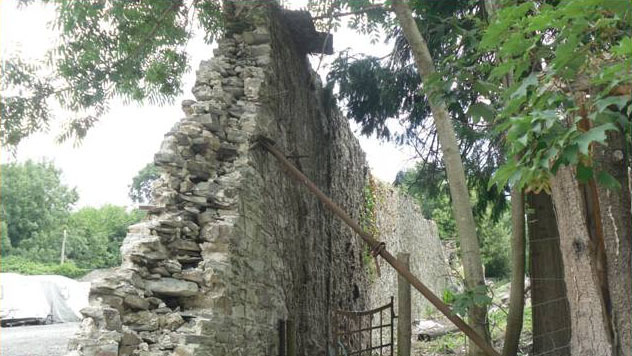 Although the lands here may of been owned by the Priory at Plympton, they were not in control of the property, and the property was certainly independant of the Priory by the 15th century when it came into the hands of the Strode family. The wealthy Strode family were MPs for Plympton and other duties included Sheriff of Devon. 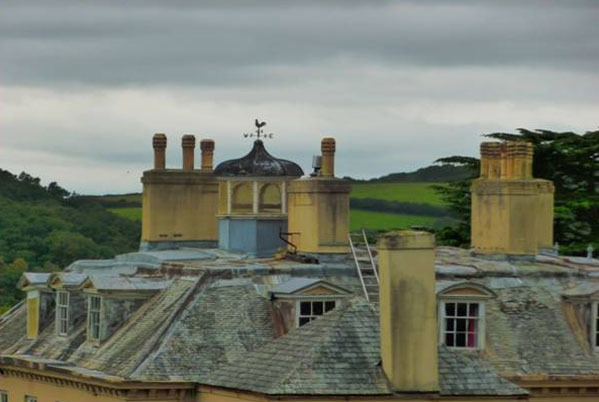 The property at ‘Old Newnham’ was the family seat up until the early 1700’s when the Strodes built a new house sometime during the 1740’s within the Medieval deer park, a short distance to the north. 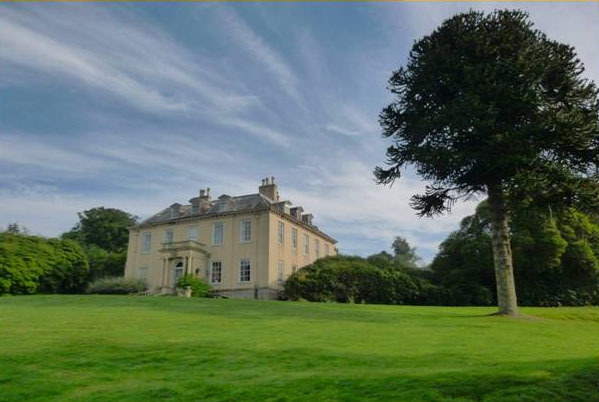 Today this house is known as Newnham House and consists of almost 1600 acres. 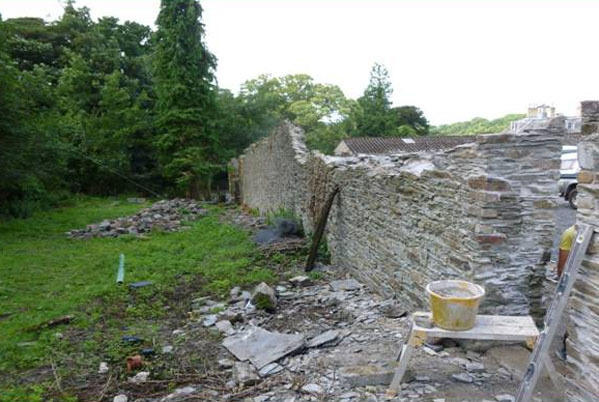 At the rear of the house lies a two acre walled garden which was built in the 1740’s at the same time the main house was built. 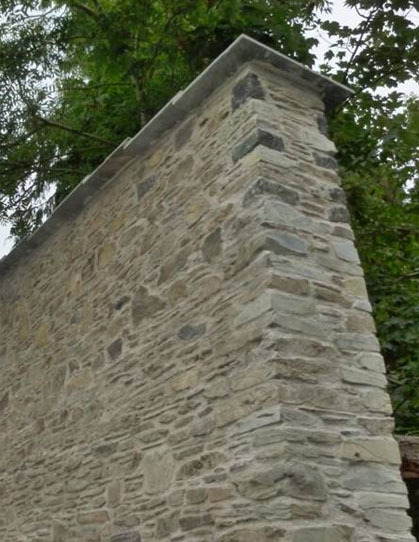 These walls are constructed in a local slate and stand at just over 13 feet tall. 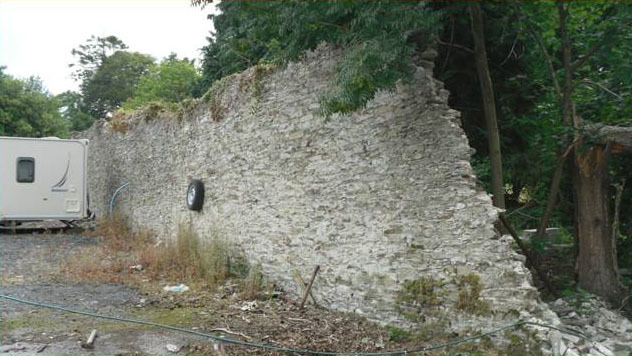 They are Grade II listed by English Heritage. 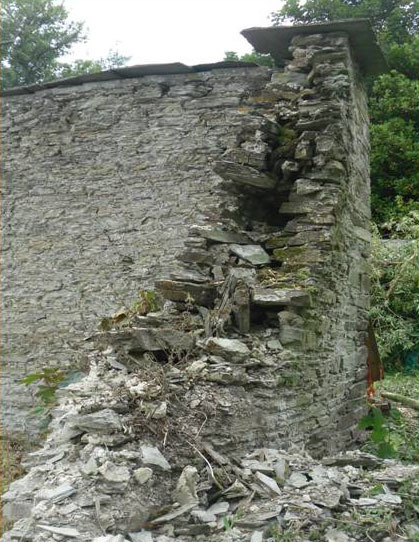 A substantial section of the garden walling had collapsed and we were instructed to carry out the repairs. 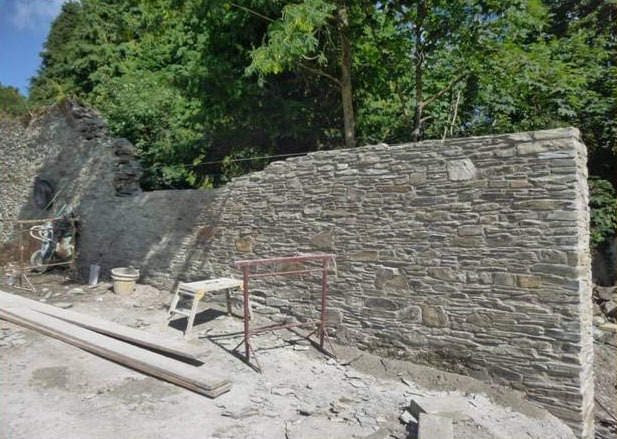 Work soon got underway sorting out the existing stone and building up the wall. 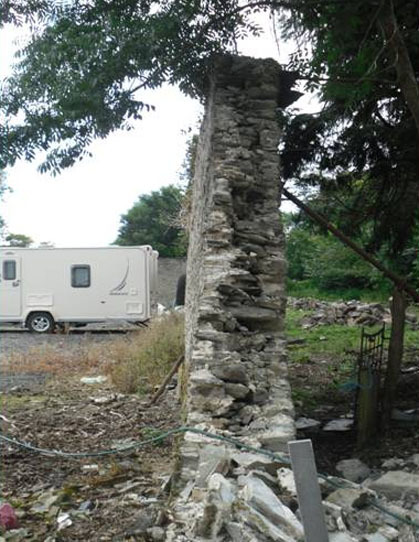 This we built up as far as we could prior to us needing a scaffold. 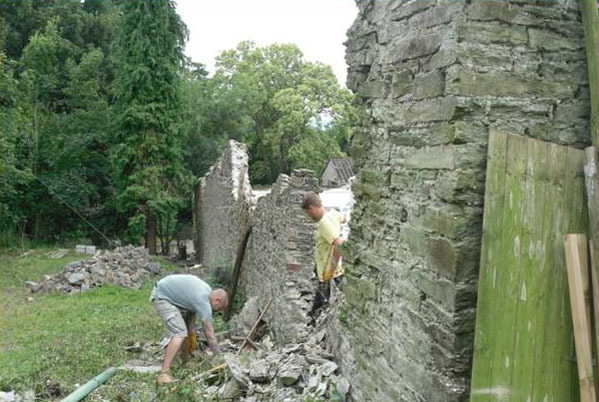 There was an existing gate opening within the collapsed section of wall and most of this had to be re-built. 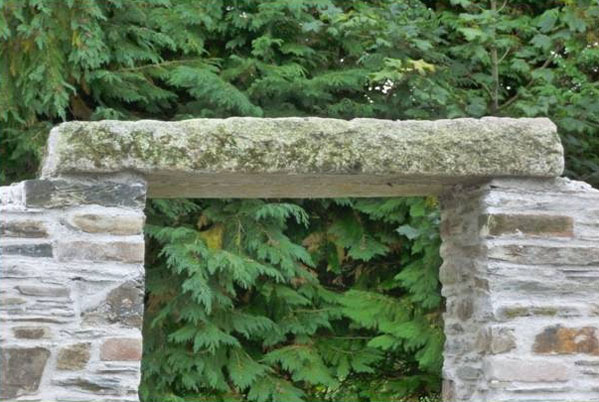 You’ll find walled gardens such as these on many large estates up and down the country and they were built at great expense by their owners. 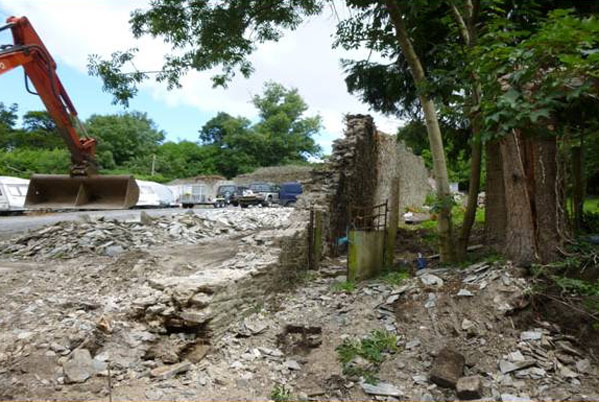 The protective walls and glasshouses within were the only means of maintaining a constant supply of fresh vegetables and exotic fruits for the estate and in its heyday would of employed a small army of gardeners to keep on top of it all. 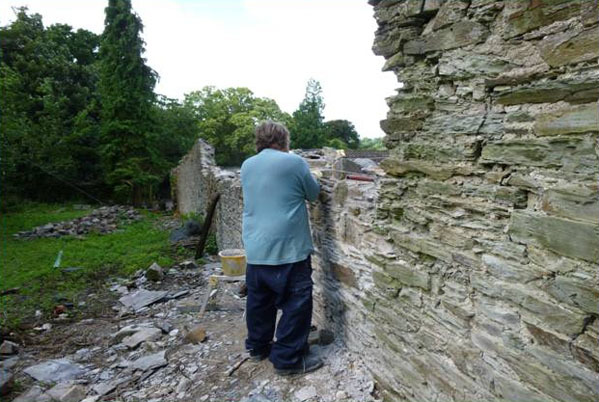 In the meantime the other end of the wall was leaning dangerously out of upright and all that was keeping it in place was a single prop. 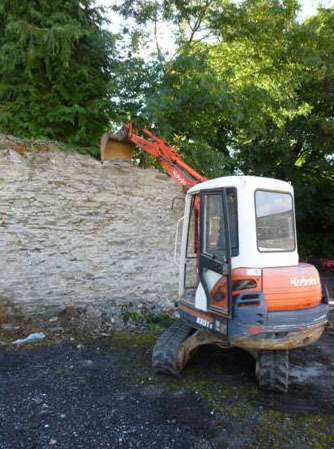 A decision was made and that section of walling was taken down by machine. 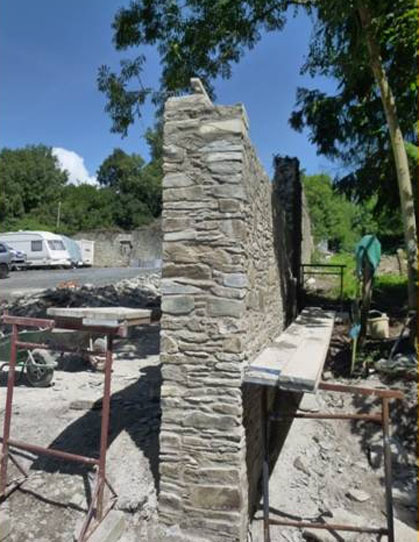 This section was also built up as far as we could go using much of the existing stone prior to a proper scaffold being erected. 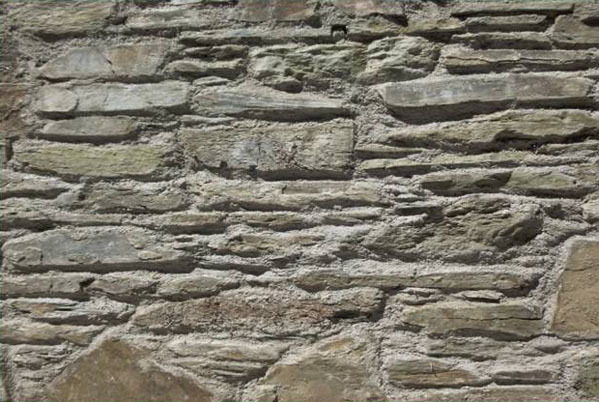 Traditional hydraulic lime mortar was used in its construction. 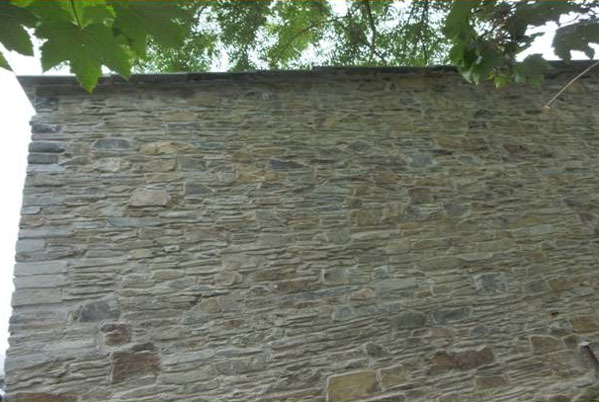 Much of the stone used in the original construction of the wall was not suitable for re-use. 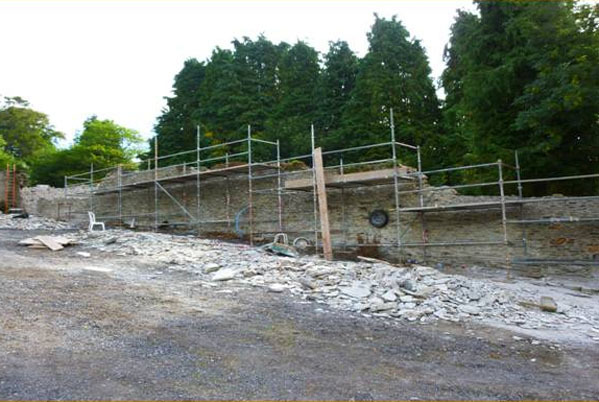 Luckily Newnham Estate has an old quarry in the grounds which once supplied stone for various buildings within the estate. 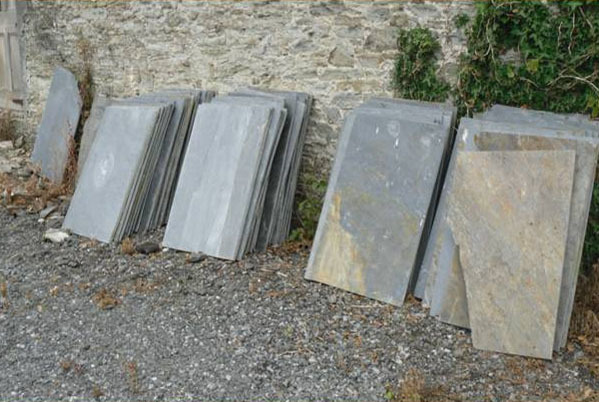 New stone was extracted from this quarry for us to use and to mix in with the original stone that was salvaged. 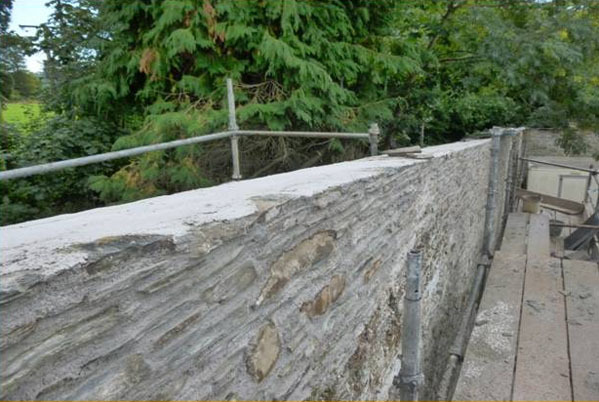 The wall at its base measured approximately two feet thick and about nine feet up from ground level the wall begins to taper in to give a finished thickness of 18 inches at the very top. 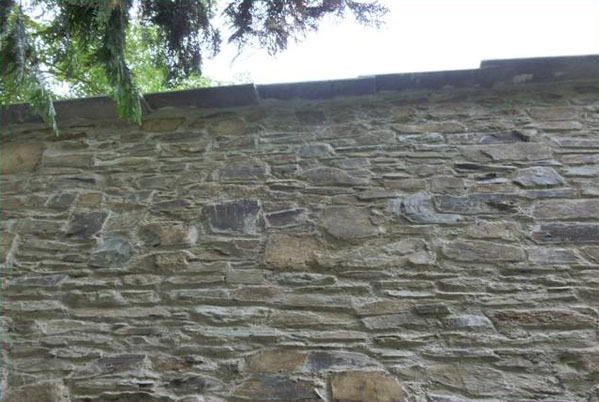 This detail was most likely incorporated into the design of the wall to use less labour and materials and also to put less strain on such a high free standing wall. 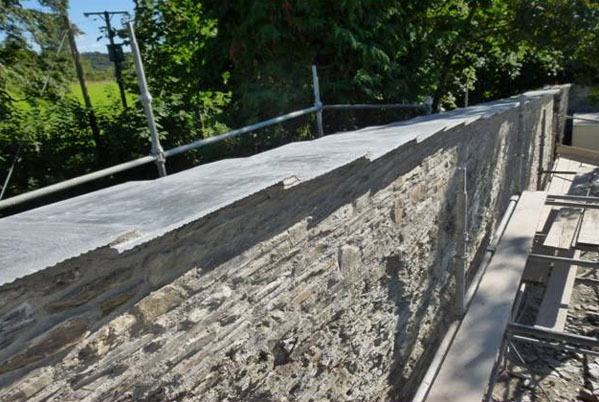 Once a proper scaffold was in place a profile was set up which enabled us to achieve this detail. 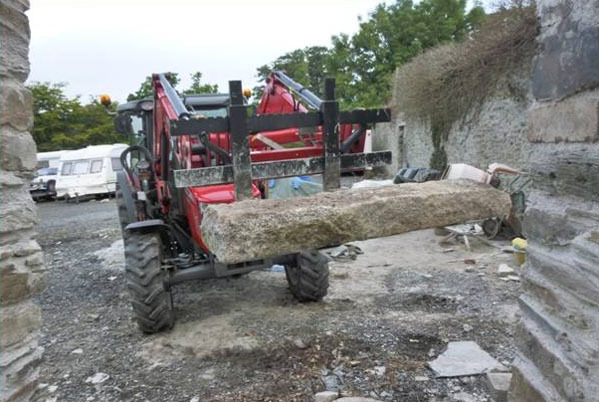 Back up at the other end of the wall the gate opening was now up to lintel height and with the help of the estate’s tractor, we lifted two reclaimed granite kerbstones into position. 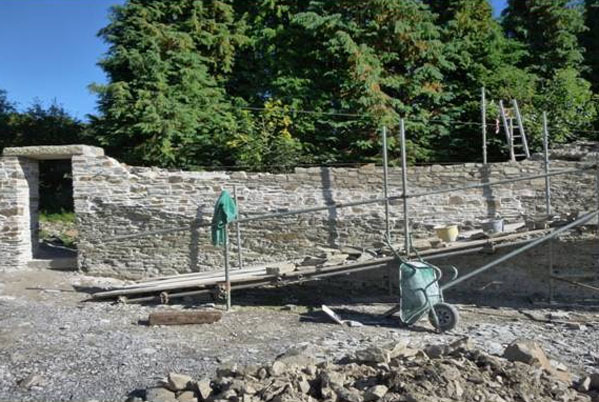 Walled gardens have been around since Medieval times and the high walls, being a key feature, were constructed not so much for security reasons but for horticultural purposes to offer shelter and an encouraging micro-climate for growing fruit, vegetables and flowers. 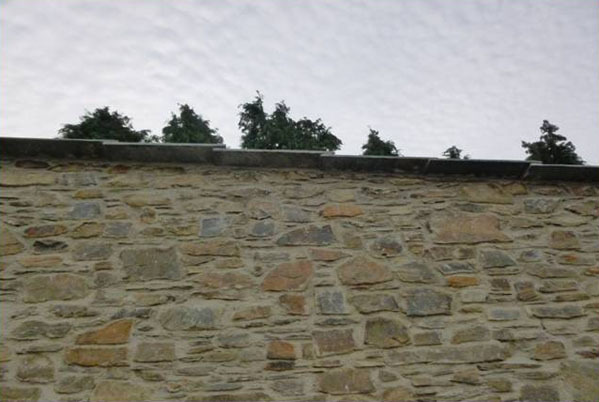 In temperate climates the walls shelter the gardens from winds and frost and in doing so can raise the ambient temperature within the garden by several degrees, allowing this micro-climate to grow plants that would not otherwise survive in an unchanged local climate. 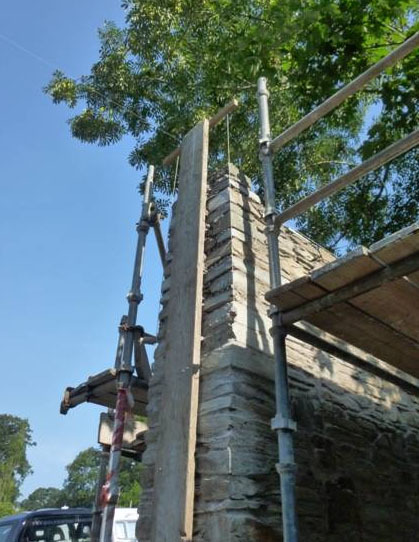 Now that a scaffold had been erected it enabled us access to the higher levels of the wall. 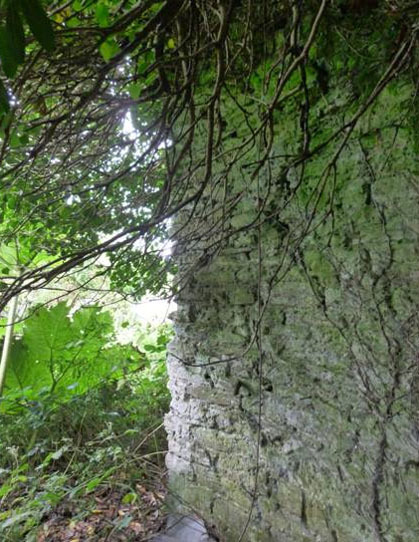 Some parts along the top were heavily infested with roots and vegetation. 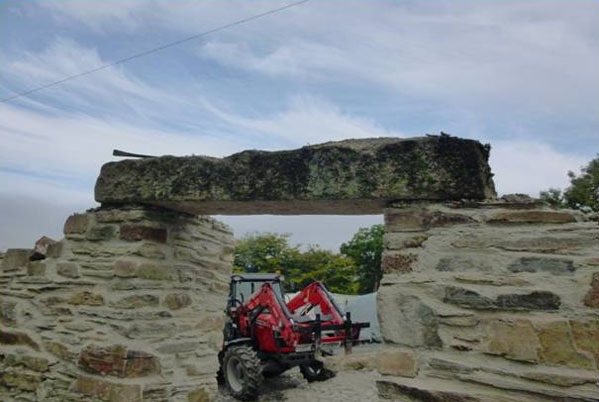 These were taken out and the stonework treated with a strong herbicide to kill off anything we missed. 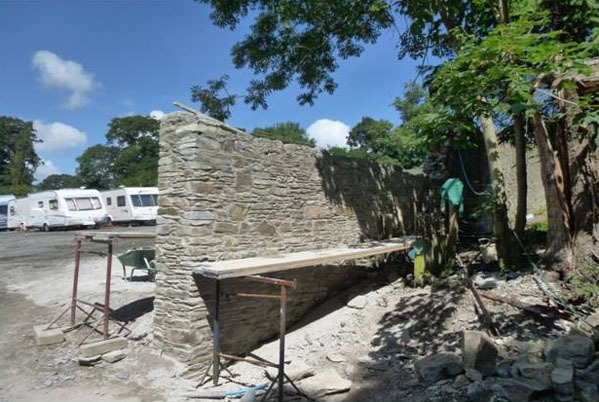 The stonework along the top was then built back up to its correct height in preparation for a new slate coping, and this coping was to go along the entire length of the wall. 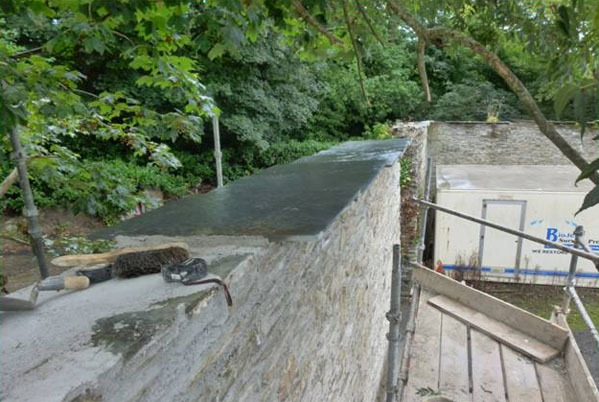 Much of the original slate coping that sat on top of this section of garden wall had disappeared over time and new slate was ordered to go back in its place. 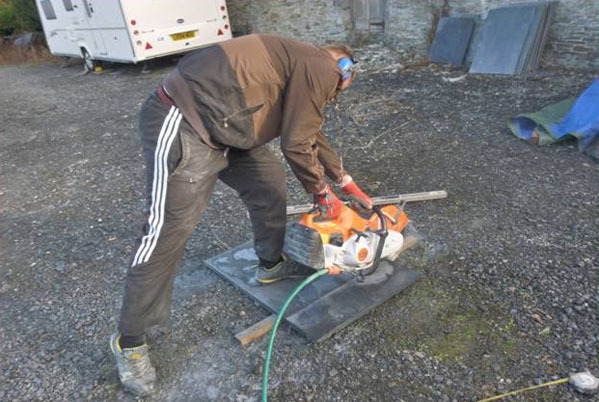 Every piece of slate had to be cut to match the dimensions of the original coping stones which had an average overhang of about five inches on both sides of the wall. 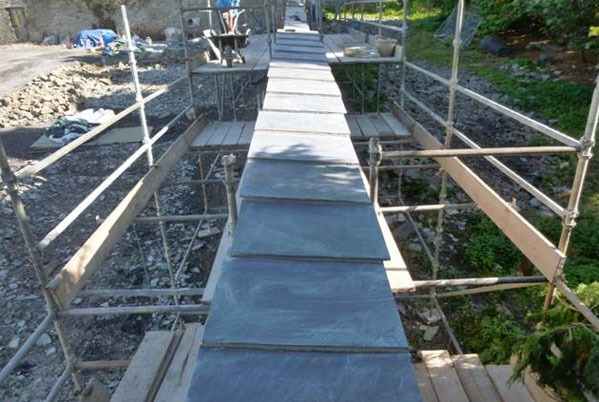 The total length of wall to receive the new slate was 130 feet. 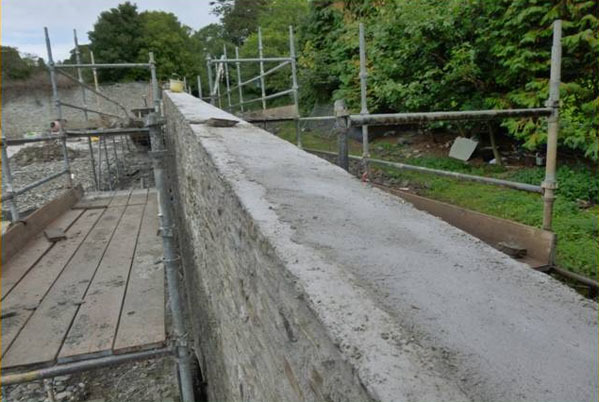 Once cut, the new slate coping was put back in place. 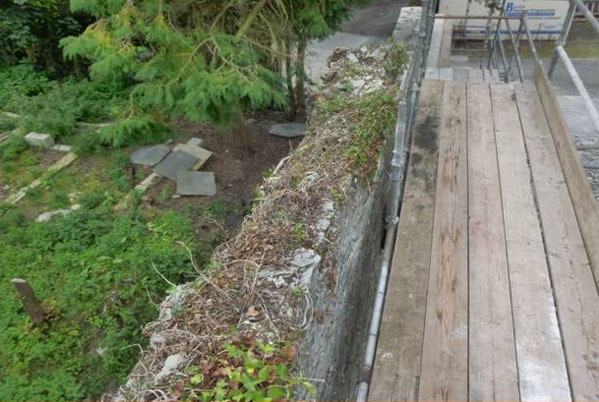 Although the wall slopes from one end to the other there is also a cross fall of about two inches and this ensures that any rainfall falls to the outside of the garden. 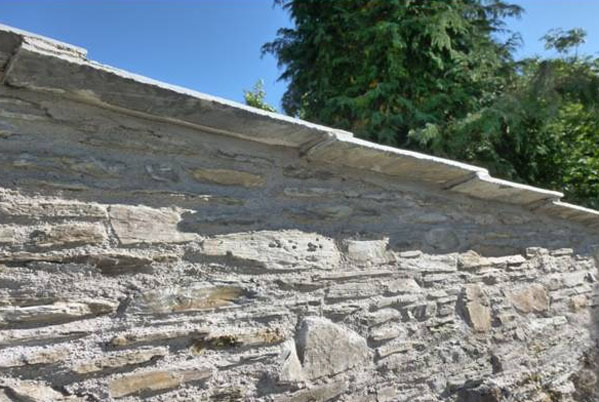 We had to sympathetically match in the details of the original slate coping to replicate the other sections of garden walling and the slate is set on top of the walls overlapping each other by three inches, which is far better than just simply butting the pieces together as the mortar between the joints would fall out over time and create a weakness, also by overlapping each piece it is a much stronger design as it locks each piece in position. 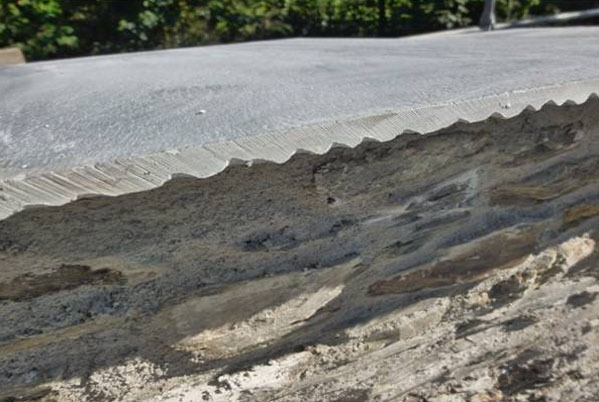 All the original slate coping varied to some degree in width and to copy this detail we randomly staggered the new slate coping by about an inch so as not to create a dead straight line. 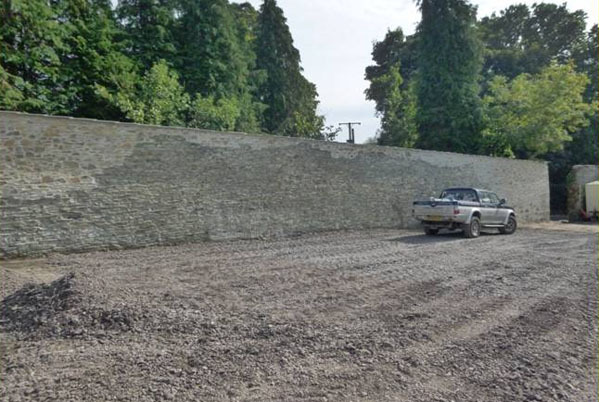 Usually these garden walls are either built from stone or brick as they absorb and retain a great deal of solar heat releasing it slowly to raise the temperature against the wall which enable fruits like nectarines, peaches and grapes to be grown against them. 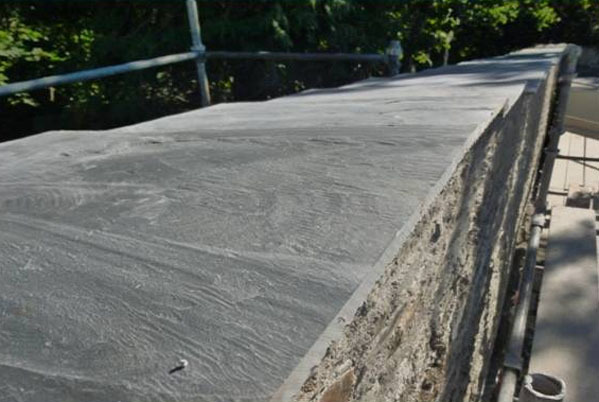 The underside edge of the slate coping was pitched by hand to give a ‘fettled’ edge and this gives the slate a more natural look. 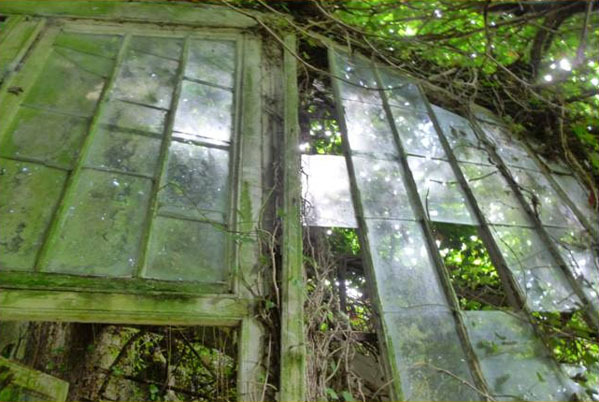 Sadly all the glasshouses and buildings that once served this big garden are now derelict. 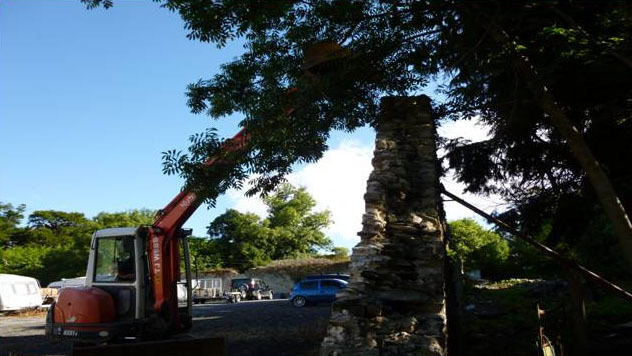 Over the years trees, ivy and other vegetation have taken their toll making access to much of them difficult and almost impossible to some areas, and just to restore the glasshouses alone would be a huge undertaking in itself. 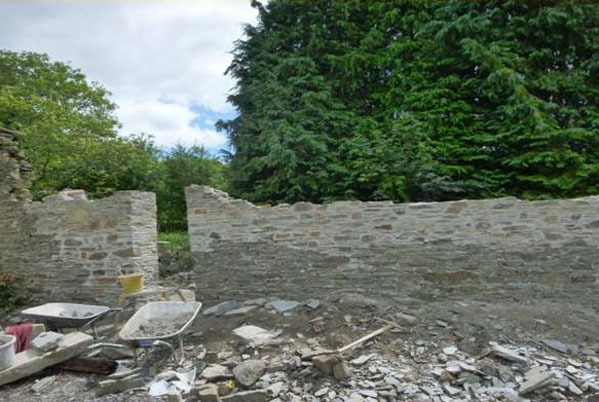 Finally once all the work was completed the scaffolds were dismantled and the site tidied up to hand back over to the client. 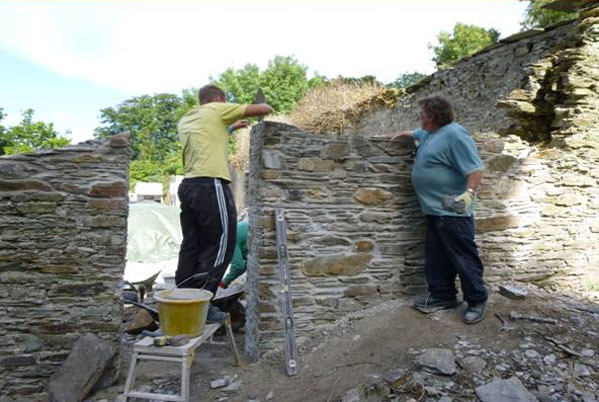 Along the section of wall we were working on, in total, just under half of it had to be rebuilt. 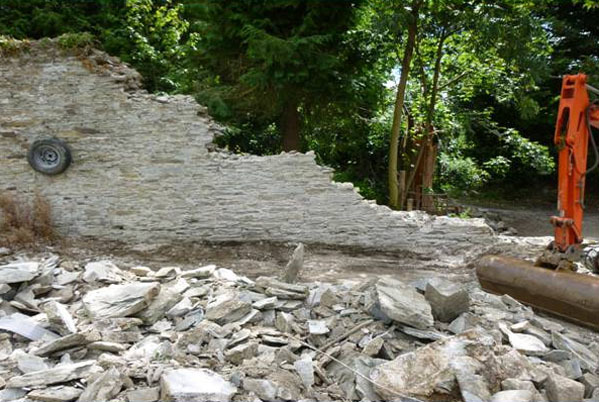 There is still much more work to be carried out to these garden walls and hopefully one day these repairs will be carried out. 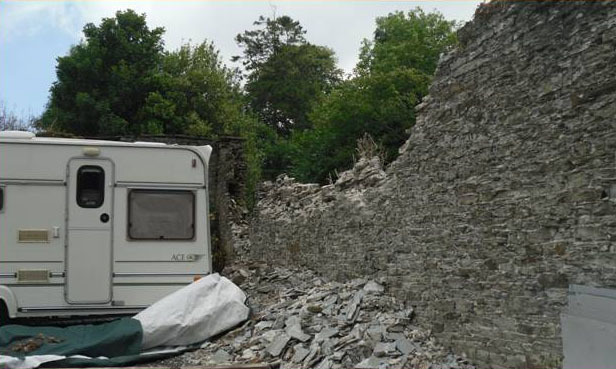 In 2016 another section of wall collapsed on the north side of the garden. We were called back in again to put it right. You can read about this if you click here.